Guy Rouelle, AAAE, Joins DuBois & King - DuBois & King, Inc.
DuBois & King is pleased to announce that Guy Rouelle, AAAE, has joined the firm’s Airport Engineering group as Senior Airport Planner. Guy brings to DuBois & King 33 years of varied, in-depth experience working in and around airports. His expertise includes an understanding of public administration, planning, project development, contracts and grants administration, airport operations and maintenance, security, property management, easement acquisition, airport facilities, and FAA and airport regulations. Most recently, Guy served as the Vermont Aeronautics Administrator overseeing the ten state airports. In this position, Guy was ultimately responsible for the execution and distribution of work through the state aeronautical service retainer contracts, and he provided oversight of the entire Vermont State aviation property management program, which involved more than 270 airport leases. During his tenure, Guy transformed many state airports from a condition of disrepair to fully functional, FAA-compliant, revenue-generating airports. He had the vision and trusted relationships with local, state and federal regulators, the congressional delegation and the FAA to secure discretionary funding to address 56 years of delayed repairs to Vermont airports in under 6 years. 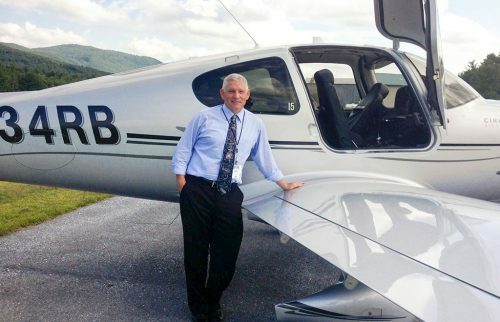 Guy’s previous positions have included aviation education coordinator, aviation accident investigator, and chief pilot for the Vermont Agency of Transportation. He is a master flight instructor and DOD Air Traffic Control Examiner, and he served in the U.S. Army Aviation Branch and the U.S. Air Force. Guy holds multiple aeronautical ratings, including commercial pilot, multi-engine rating, certified flight instrument instructor, FAA Designated Pilot Examiner, and TERP instructor. He holds a master’s degree in Aeronautical Operations, a bachelor’s degree in Aeronautical Science and an associates degree in meteorology. Guy’s deep expertise in all things airport combined with his passion for the aviation industry make him a strong asset to D&K’s airport engineering team. Guy lives in East Calais, Vermont, and works in the firm’s Randolph headquarters. Contact Guy at grouelle@dubois-king.com.